Alexander Mundy, Author at D.L. Howell and Associates, Inc.
2018 was a very wet and rainy year for Chester County. In fact, the county received 69.1 inches of rain in total. This is 22 inches above the average for the county and 30 inches above the national average. Chester County is not the only area though that had a record year in terms of the amount of rainfall. Reading, Baltimore, and Atlantic City have all set records for the amount of rain they received last year. All that rain can cause havoc for a property owner. Standing water in the yard, flooded basements, and soil erosion are just a few of the effects that can be caused by vast amounts of rainfall. Standing water in your yard can create a breeding ground for mosquitos, drown plants and grass, and create slick or dangerous yard conditions. Flooded basements can be a result of downspouts being clogged or not piping the water far enough away from the house. Excessive concentrated runoff can cause soil erosion. If soil erosion happens to your property, it is better to correct the issue quickly rather than waiting. Waiting could result in even more damage and cost more to repair the problem. One way to fix these issues is to fill in any gulleys or affected areas of your property with soil and reseed the area. Another fix is to put in a swale or a seepage bed. A swale can be used to direct water away from the area that has been eroded. This can give time for the affected area to grow grass and stabilize. A seepage pit can be put in the area of standing water or in an area that receives a lot of water. Water can be captured by overland flow by a yard drain and then piped into the pit below ground. Here at D.L. Howell, we are trained to take these issues and turn them into a positive result. Please contact us with all your erosion problems and we will be glad to help! It’s almost that time of year again. The time when all the leaves on the trees change colors and make for beautiful scenery. At the same time, this could cause problems for a homeowner. The once beautiful view will change to mostly all brown, and eventually, the trees will become bare. This is where the havoc can set in. Leaves have clogged drains, gutters, inlets, and yard drains causing flooding issues if not taken care of. It is essential to inspect and maintain all of these to ensure that no flooding can occur around or near a building. During inspections, gutters, inlets and yard drains should be cleared of all sticks and leaf debris. It is always good to inspect before the leaves start falling to make sure that there are no blockages in the conveyance system to cause any flooding. If there are blockages before the fall and they are not taken care of, the leaves falling can cause even more problems for your system. The flooding can cause potential problems for the basement which could lead to a mold issue. If any flooding or ponding issues occur and there are no known blockages in the system, please contact D.L. Howell & Associates, Inc., and we can assist you with your drainage issues. What is a Limiting Zone? Stormwater infiltration testing is required for projects that require stormwater management. In most cases, the infiltration rate computed by these tests are fine, but in some cases, testing doesn’t work due to limiting zones. A limiting zone is defined as the upper limit of any zone or soil layer that is expected to limit the soil’s ability to treat the wastewater. More or less, it means that water cannot infiltrate the ground in this area. Some forms of limiting zones are high water tables, shallow bedrock, and redoximorphic features in soils. High water table and shallow bedrock are pretty much straightforward. You dig down and hit solid rock, there’s your limiting zone. You dig down and the hole begins to fill up with water, there’s your limiting zone. But what are redoximorphic features? These features can form when the soil is saturated to the point that most all pores are filled with water and there is an absence of oxygen, or when changes to the chemical processes in the soil occur. When the hole is dug for the test, an examination of the soil is necessary to determine if these features occur. A way to determine this is if the soil has a reddish color to it. This shows that the section of soils has a potential to contain groundwater at certain times of the year. If these features are encountered during the time of testing, a new location must be chosen, or the infiltration system bottom must be set at a minimum of two feet above the limiting zone. Contact D.L. Howell & Associates, Inc. for all your infiltration testing needs. The increase in college tuition has been on a consistent rise over the last several years. In fall of 2016, it was determined that tuition costs have reached a record high. For an in-state student to attend a public university, the total costs have gone up more than 2% compared to 2015. One of the reasons for this is because the financial aid and education tax breaks stayed flat. If we compare public tuition costs from 10 years ago and now, the average cost has more than quintupled! Private colleges have seen an average increase in tuition of more than 3%, with some of this increasing by more than 5%. Of course, we can expect tuition to increase with inflation, but out of the last 35 years, tuition rates have risen faster than inflation. If the tuition rates continue to rise at this steady percentage, in 20 years, a private school could cost close to $120,000 a year and public $54,000. Most Pennsylvania private colleges that offer four-year bachelor’s degree in civil engineering cost almost $60,000 per year and pu\blic schools cost anywhere from $28,000 to $31,000. Upcoming high school graduates will have to seriously consider if college is actually worth the debt that will be accrued. As cost continues to climb, we may begin to see a rise in university alternatives, such as community college or trade school. Smoothie King West Chester Opening Weekend is Just Around the Corner. 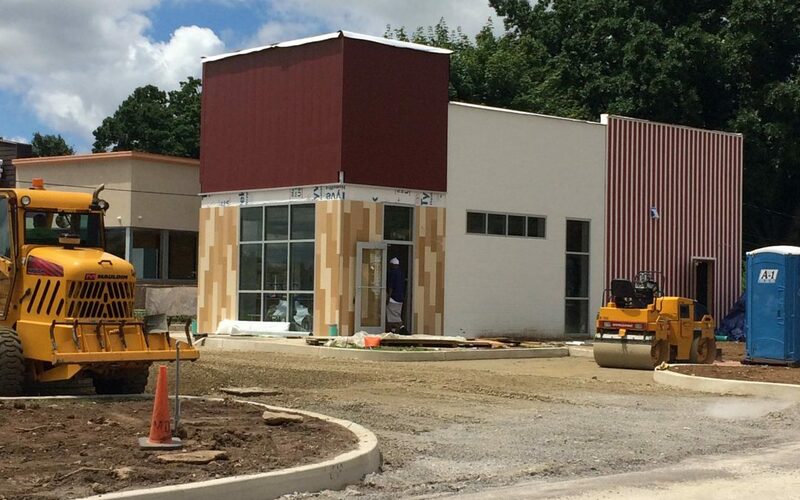 Smoothie King is close to completion! Construction is well under way and opening weekend is just around the corner. The weekend of July 22nd and 23rd customers will be able to purchase their delicious and healthy smoothies. Located at 1011 West Chester Pike in West Chester, the site replaced an existing building and parking lot with an 850-square foot smoothie shop to satisfy all your smoothie cravings, especially during these hot summer days. Access to the Smoothie King will be from Rose Lane, and the store will feature a drive-thru for smoothie drinking convenience. D.L. Howell proudly provided land development plans for the project including but not limited to grading, erosion, and sedimentation control design, and stormwater management design. Be sure to stop by and check them out!